All nursing wards on the Haaksbergerstraat site of the Medical Spectrum Twente hospital in Enschede are being given a refurbishment. An element of this refurbishment includes the installation of an electrical system on the fifth floor nursing ward. Following this, similar activities will then commence on the fourth floor. In short, this is a phased project. Moekotte has implemented this project on the basis of a well thought-out Plan of Action. The works had to be carried out within a short period of time and amidst the day-to-day activities of the hospital. This is an aspect that Moekotte knew specifically how to deal with during the implementation of this project. During the installation of the electrical system, Moekotte has carried out the following work: • Removal of all fittings, lights and switch equipment. • Removal and installation of all fire alarms. 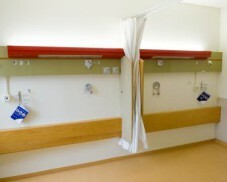 • Replacement of all fittings, switch equipment and the nurse call system. The works have thus far been carried out to the complete satisfaction of the customer.